In the battle between Hillary Clinton and Bernie Sanders for labor union support for the Democratic presidential nomination, Clinton has a strong and growing lead in official endorsements, but Sanders may have the lead in member support—as well as in the passion of his supporters. One signal of his appeal to union members is the respect and fondness many union leaders, even those supporting Clinton, feel toward Sanders. Often Clinton backers favor her for a variety of seemingly pragmatic, if debatable, reasons—her likelihood of defeating the Republican candidate or union leaders’ desire for inclusion in the Democratic Party establishment that she represents (even though that party leadership often slights the needs of working people and unions). Many union leaders also seem reluctant to adopt a serious campaign to win more public support for Sanders and his ideas—even though he more consistently and vigorously advocates labor’s agenda than Clinton does. But many union members, both Democrats and many independents, believe in the policies and the overall vision of an expanded New Deal that both the labor movement and Sanders have long promoted. Yet Sanders appears to have more confidence that the broad American public will back those ideas and reject likely Republican and media attacks on his proposals, or on his self-described “democratic socialism,” than do many top union officials who often complain about Democrats who will not support labor and its agenda. In this past week, Clinton picked up support from leaders of the United Food and Commercial Workers (UFCW) and the International Alliance of Theatrical Stage Employees. The last major union endorsement of Sanders came in the week before Christmas from the 700,000-member Communication Workers of America (CWA). His biggest union stamp of approval so far may have brightened the mid-winter holiday season for the campaign, but the real gift will be in the growth of union members recruiting primary voters and caucus-goers for Sanders. CWA joined other national unions who recently endorsed Sanders—the American Postal Workers Union; the National Nurses United, the largely California-based National Union of Healthcare Workers; and the United Electrical Workers (or as close to an endorsement as the fiercely independent union is likely to make). Also, Sanders draws support from at least 40 local unions, many of them affiliates of national unions endorsing former secretary of state Hillary Clinton, some of whom overlap with the 10,000 individual union members of the Labor for Bernie organization, which operates independently of the campaign. Clinton can claim 21 endorsements from individual unions or groups of unions, including such large unions as AFSCME (public employees), the American Federation of Teachers (AFT), the National Education Association (NEA), the Service Employees (SEIU), the Machinists, the Laborers, Plumbers and Pipefitters and the Carpenters. By past primary standards, all of these endorsements come fairly early, and several large, influential unions are still holding back, including the Steelworkers (USW), Auto Workers (UAW), the Amalgamated Transit Union (ATU), Teamsters, the International Brotherhood of Electrical Workers (IBEW), and Hotel and Restaurant Employees (UNITE HERE) and the Firefighters (IAFF). The combination of the few unions endorsing Sanders and those withholding judgment could delay the time when the required two-thirds majority of the AFL-CIO Executive Council needed to make any endorsement will materialize, according to CWA president Chris Shelton, who would like to slow down any AFL-CIO action. But more decisions for Clinton from other big unions could accelerate the process, a development the UFCW hopes its decision might spur. The executive council meets next in late February. One big difference between the two labor political camps is that union members supporting Sanders seem to show much greater enthusiasm for their candidate. Sanders’ organizers claim their crew is eagerly doing the hard work of educating and mobilizing, especially but not only in the earliest states, Iowa and New Hampshire. Labor for Bernie reports that the greatest volunteer enthusiasm has come from members of the International Brotherhood of Electrical Workers (IBEW), AFT, UAW, NEA, Teamsters and SEIU, plus many workers from building trades unions who are often assumed to be politically more conservative than leading industrial and service unions. Sanders has benefitted from the zeal of workers like Carl Shaffer, 58, an IBEW electrician and former union organizer from Plymouth, Indiana. Starting late last summer, Shaffer helped reach around 1,000 IBEW members who supported Sanders, asking them to urge their union president, Lonnie Stephenson, to delay any endorsement. After quickly winning his agreement, a smaller core of the group worked to keep IBEW activists informed on social media and build support for local union endorsements of Sanders. Other union members feel unease with Clinton for various reasons. The New York Times reports that the small but politically important Firefighters union was moving last year towards backing Clinton but has chosen to continue deliberations for the near future. Although a majority of members identify as Republican, the international union typically endorses Democratic presidential candidates. But union president Harold Schaitberger has urged members to be involved on the union’s issues but to hold off any institutional endorsements. In some cases, union leaders face a Bernie-booster backlash if they endorse Clinton. Last Halloween, Clinton showed up at the Charleston, South Carolina, union hall of the dockworkers (International Longshoreman’s Association [ILA] Local 1422) and received an endorsement from both national union president Harold Daggett and local president, Ken Riley, a much-respected figure on the labor left. 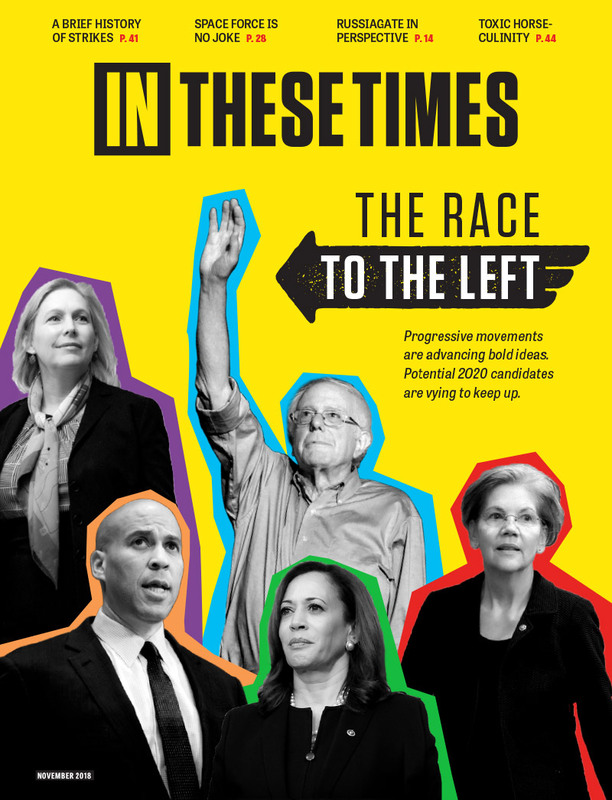 As I report in the February issue of In These Times, Riley says he backs Clinton because, “I want to win,” not simply to “send a message.” Most head-to-head polls with leading Republican candidates show that Sanders—with his appeal to many independents—performs better than Clinton. Riley thinks that black voters are more familiar and comfortable with Clinton and that women will be excited at the prospect of electing a woman as president. He warns that Republicans will redbait—or “play the old socialist game”—against Bernie and his “political revolution,” making him vulnerable, a concern also expressed recently by UFCW vice-president Stuart Appelbaum to Politico. But some members of Riley’s local, led by a vice-president of the state AFL-CIO who was previously part of Sanders’s leadership team, Charles Brave Jr., are now campaigning to overturn the endorsement and back Sanders by a vote at the next membership meeting. Brave claims the turnout for Clinton at the union hall was poor, especially considering her fame, and that no other local union officials joined Riley on stage with her. Although conversations I had with dockworkers earlier in October—a time when most black voters in the state knew little about Sanders--indicated moderately strong support for Clinton, Brave and his supporters had not really launched their campaign for Sanders. In the past, top union officers or executive boards made most endorsements on their own, but increasingly most unions at least use some polling to make or justify decisions, although for a variety of good and bad reasons, the systems are rarely fully transparent. CWA’s polling system is among the more open. Shelton wanted to make sure that CWA’s endorsement reflected the members’ wishes, even if it was not necessarily his. That approach would strengthen the union because members would see the result as their choice, and other players in the electoral cycle would recognize its foundation and legitimacy, he says. Shelton was elected last year to move the union along the overall direction former CWA President Cohen either started or amplified from predecessors: first, more mobilization of members; then, “movement-building” that brought labor and other movements together into an initiative for greater democracy—of the union, of its campaigns and of most facets of American society, presenting a broad-based challenge to corporate and financial power. As preparation for a decision on the presidential endorsement, CWA distributed information online and in their newspaper, such as candidate answers to questionnaires and links to their positions on issues. (Although both Democratic and Republican candidates were invited to submit materials, only Mike Huckabee from the Republican roster took up the invitation.) Members were invited to submit their choice on-line, and “tens of thousands” participated, resulting in a “decisive endorsement” of Sanders, according to political director Rafael Navar. Other unions follow procedures not so different, if less comprehensive, but Shelton made a big shift in this year’s CWA process by giving members the power to decide directly, first, whether to endorse and, second, whom to endorse. The officers deferred to the members. “Through it all, I asked our executive board and myself as well to stay completely out of it,” Shelton says. Of course, former president Cohen had already joined the Sanders campaign, but Shelton says the officers did not try to sway the members nor does he think Cohen’s preference greatly affected results. Indeed, CWA members cast ballots for Republicans as well as Democrats, though the union does not release a precise breakdown. (Shelton says about 30 percent of CWA members identify as Republicans.) But it is likely that the political education campaign the union has undertaken over the years to strengthen the union—building a “moral, radical, progressive movement against corporate power,” in Shelton’s words—quite legitimately resonates with Sanders’ own message. Although Shelton doubts the AFL-CIO will reach a two-thirds consensus soon, he says that “we will stick with our choice” regardless of the federation’s decision because it has legitimacy that grows out of the union’s “bottom-up” procedure. “A lot of endorsements are not worth the paper they’re printed on unless you can say the members are behind who you endorse,” he says. Also, the case that Shelton and other supporters make for Sanders as a serious candidate with a chance to win is certainly plausible. The evidence is partly just the campaign’s remarkable organizing and fund-raising success so far, seen in its strong and improving poll numbers. Republicans will surely attack any Democratic candidate as a wild-eyed radical, but two developments could help Sanders if he’s the standard bearer. First, much polling indicates that the electorate, especially younger voters, is becoming more open to socialist ideas or less frightened by the label. Second, Sanders shows that he can persuasively defend himself and his version of socialism—essentially an expansion of the New Deal along the lines that Franklin Roosevelt wanted. As a candidate, he can also effectively take the offensive with a popular attack on excesses of the rich and powerful. The big question is whether his newly adopted party, labor unions and other progressive campaign groups are willing to make such a fight for the same ambitious vision—rather than offer only a grab-bag of mushy or minor poll-tested proposals designed to continue selling candidates like soap. Full disclosure: In These Times staff are members of the Communication Workers of America, and the union is a sponsor of the magazine. Sponsors play no role in editorial content. Oh well, your characterization or, rather, your caricature of me is so far off as to be delusional. As for your suggestion that I should "get elected" to a union position, I'll just remind you of what I mentioned above: namely, that I have held a variety of positions including president of a council of over 40 locals in a city of over 2 million people, executive member in a division of 24 locals, national delegate and local shop steward (beginning in 1975 and continuing today), etc., etc. On balance, I'd say that I have been modestly effective in matters of organization and mobilization. You seem to be looking for "Trotskyites," "liberals" and children from "upper middle class homes" under every bed and in every closet. Sorry, brother, you are waaaaay off the mark. Class consciousness? The CIO vs the UE, sure as if you are 100 year old anti union Trotskyite who views themselves as a member of the vanguard leading their coworkers forward in the great leap forward. Your statements were and are anti union. If you want to make change, get elected and if that fails it just means that your coworkers don't agree with you. Like most fake revolutionaries who infiltrate Labor as part of a hegemonistic stratgy, you should have learned that most American blue collar workers reject your policies.We have enough bosses without adding to that list the sons and daughters of the privledged class. Unlike you, I view much of labors problems as being initiated by jelous anti union liberals who believe workers are not bright enough to run their own organizations. It usually come from growing up in a upper middle class home where the working class was viewed as unable to understand what is good for themselves. Over the years I have grown extreamly tired of non working class liberals telling me what is wrong with organized labor while doing absolutely nothing to support workers struggles. I have certain criticisms of some labor leaders past and present ... for instance with the CIO for its attacks on UE. I have criticisms of some labor organizations today. To want to reform some aspects of the union movement is not to "attack labor," it is to encourage a more class conscious and militant movement rather than submit to collaborationist elements within it. Remember it was you, not me who attacked Labor. I simply called out your anti union statement. Such outrage. Such misdirected outrage. As it happens, I am not a "liberal" and I do not hold any of the beliefs that you falsely attribute to me. I have been a trade union member for 44 years, a union official for 41 years and a shop steward in my workplace for the best part of 30 years. In a published history of my union, I was even identified as a "militant." I admire your enthusiasm, but I would be more impressed if you directed it toward our class enemies. My union, for example, is actively involved in organizing the unorganized, working relentlessly on rank-and-file mobilization, taking anti-union practices to court - sometimes even winning small victories - and making alliances with progressive organizations. We have sent our top organizers (when requested) to places such as Wisconsin to help in the public-sector workers' struggle against the likes of Scott Walker and, among other things, gifted $60,000 to assist the local "Occupy" movement a couple of years ago. Somehow, I don't think that amounts to collaborating with union-busting law firms and politicians. you are stuck in some strange folk music view on what and how the working class is and how Organized Labor conducts itself. That view is usually based in sentiment held by the UMC and the privileged that the working class are simply to stupid to run their own organizations and that if a group of working class folks form a union, elect individual representatives, establish their own rules, that the body of working class individuals whom comprise the membership cannot be trusted to govern their own organizations. You also indicate that the working class should submit their organizations to review by non members who should have the last word in the governance of their organizations. You believe that it is you, the middle and upper middle class as well as the privileged who know best how achieve the aspirations of the working class and that the working class should submit to your leadership. Let me suggest you go try that with any of the community groups, neo hippie organizations and groups ran by welfare pimps first and get back with me how that worked out for you. The American Labor movements decline has direct relationship to the adoption of Taft Hartley in 1947 and its expansion via Landrum Griffin in 59. You also have little understanding of why liberals like yourself have openly opposed its repeal which is mainly based on their desire to never have to deal with the working class as equals. As far as what you have said about Labor's failure to engage liberal controlled interest groups you have failed to address many of those groups anti labor sentiments. It is common for liberals to advocate that Unions should abandon being Unions for them to survive. it has been Labor that has done more to lift people out of poverty than any so called anti-poverty activist have ever done, it is the environmental groups which are mainly comprised of non working class anti worker individuals who dictate to labor organizations and the working class that they should uncompromisingly give up their standards of living and throw themselves into State dependent lives of poverty to further their narrow goals. It is always Labor that must compromise at the expense of financial well being of the blue collar worker to advance the cause of the privileged and wealthy, and let me remind you it has been organized labor who has consistently stood for and advocated for race and gender equality in the workplace. Liberals like yourself always forget things and events where their heroes like RFK attacked James Hoffa for forcing specific Southern Teamsters Local Unions to integrate it was the liberal RFK that demanded that Hoffa as the elected leader of the IBT allow for and support segregation. There is a difference between liberals and progressives and one of the defining issues is the fact that liberals openly attack the working class and adopt anti union positions. It is people exactly such as your self who denigrate and attack organized labor to protect and further their hold on privilege, it is you that are the enemies of the working class possibly even more so than the union busting law firm or politician who is open and clear regarding their views and sentiments towards the working class. Woofer, you don't even know what you are talking about. it has been the adoption of Taft Hartley and Taft Hartley alone that has led to Labors decline. I am very confident that Big D Democrats placed calls to labor leaders demanding their support of HRC or face the consequences. i have witnessed similar telephone conversations. You act as though there was any hope that leaders within the Democratic Party would ever allow for someone who is not a Democratic Party member to become their nominee.Even though I strongly support Senator Sanders I understand the reality of Party politics. There is absolutely no way the Democratic Black Congressional Caucus would allow a White Republican to run their organizations a parallel can be drawn between Sanders and the Democratic Party. Instead of laying blame on the working class and their organization you may want to look in a mirror as ever since Taft Hartley was adopted in 1947 "liberals" have failed to act one single time to repeal this anti working class law. BTW while I appreciate Senator Sanders message on class biases I have to wonder how many of the 20 and 30 something Sander supporters who come from UMC homes even understand that they are part of the problem with their anti union and anti working class sentiments and views, just like yours. The unions which allowed their membership to vote on endorsement (wow, democracy) chose Bernie. The unions which allowed their executive committee to make the endorsement chose Hillary. and always think they know better than the rank and file. Will not reverse Bill's decision to kill Glass Steagall = which is deregulation of the banking industry. Hillary will likely construct her own Free Trade Agreement to the detriment of the USA and our hard working people. Maybe the Union leadership should listen carefully to a song that Phil Ochs sang about 50 years ago, called "Links on the Chain." Much of the AFL-CIO leadership slops at the same corporate trough as Ms. Clinton and the DNC. They prefer to protect their privilege which the rank-and-file suffer, membership declines and little thought is given to organizing the unorganized, making alliances with anti-poverty activists, environmentalists, minority group movements and other "progressives" in a restoration of the idea of a "Common Front." Slavish subservience to the neoliberal ideology and the existing power structure is not a recipe for rebellion, but despair and denial leading the degradation and decay. Yes, and leaders are too aligned with the power of Washington and have forgotten how to build the power of the rank and file and use it to make change. We need an independent labor movement, the Democratic Party being the place where unions have gained little or nothing for 40 years. thus becoming a place to die. Some say this decline goes all the way back to Taft-Hartley and unions' putting all their eggs in the basket of the Democratic Party. Labor independence and the education of workers. These are key. This piece documents the reasons why unions are in decline. Except in small pockets, idealism has disappeared. The career leadership chooses opportunism over passion. If the leaders are not motivated by conviction, why should anyone follow them?